Exclusive: The think-tank study indicates GDP would be 2.3 per cent higher had the UK voted to remain in the EU. Brexit is already costing the UK’s public finances £17bn a year, according to a detailed study released ahead of critical votes in parliament this week. The amount would be sufficient to pay 10,000 more police to patrol the streets and train nurses to fill every vacancy in England, and still leave enough to cover the UK’s current contribution to the EU’s budget. The research from the Centre for European Reform estimates the UK economy is 2.3 per cent smaller than it would have been had Britain voted to remain in the EU back in 2016. The think tank calculated that the reduced GDP would limit the Treasury’s spending power by £17bn a year, or £320m per week – around the amount promised for the NHS by the Leave campaign on the side of its touring bus. On Tuesday MPs will attempt to break the Brexit deadlock in a series of votes that could hand parliament more power to control the next phase of Brexit, though the signs are that the impasse and uncertainty may go on for weeks. But the CER’s research indicates that whatever route is chosen, Brexit has already taken a heavy toll on the British economy. Deputy director John Springford said: “Britain’s decision to leave the EU damaged growth, largely thanks to higher inflation and lower business investment. The CER’s most up-to-date analysis, passed to The Independent, used a computer programme to create a “doppleganger” UK economy which it then tracked from 2009 until today. 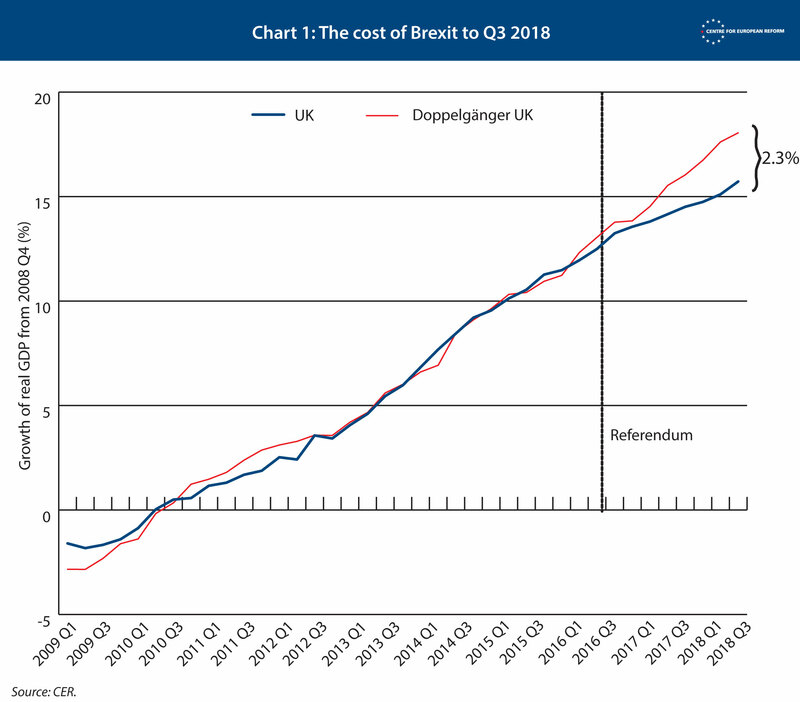 The doppleganger closely matched the real UK economy until the referendum in 2016, when the two countries’ economic performance diverged – with the real UK’s GDP 2.3 per cent lower by the third quarter of 2018. The analysis found that 1 per cent of lost GDP resulted in £7.6bn of extra borrowing. Given that there is no discernible “Brexit dividend” yet, it means that for the real UK’s 2.3 per cent loss in GDP, there is a hit to the public finances of £17bn a year. Critically, it also implies that the UK’s fiscal deficit would have largely been eliminated in the 2018-19 financial year if Britain had voted to remain in the EU. Data released by the Office for National Statistics earlier this week pointed to a need for more resourcing for public services, as it showed violent crime recorded in England and Wales has risen by 19 per cent in a year, amid plummeting police numbers.